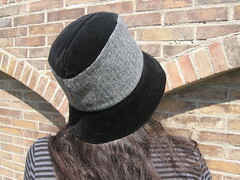 The trilby from the Japanese book is finished! My apologies to Jane for my long delay in making this hat, which should have been finished a long time ago (we were going to tackle this project together but I fell behind). She did a super job, you can see her posts on the subject if you follow this link. 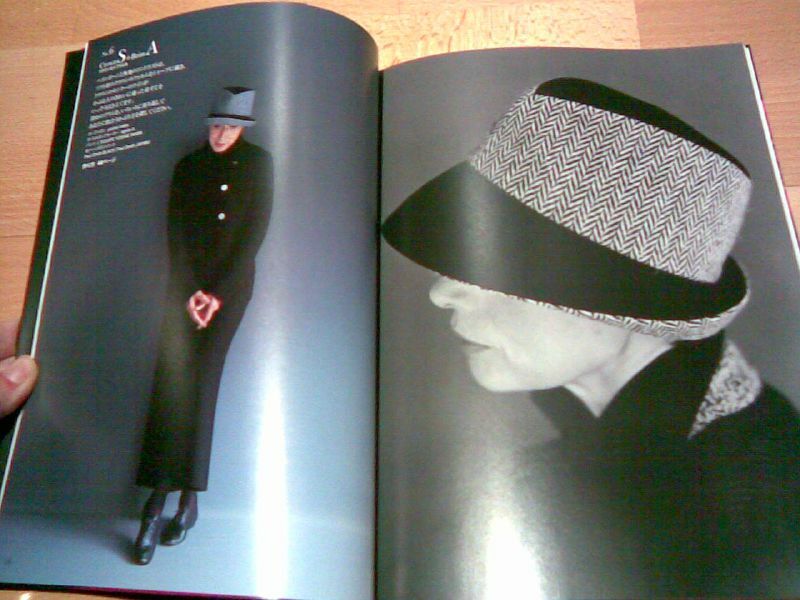 The hat pattern comes from this Japanese book. After finishing the hat I must say I get the feeling this is not really a trilby (the pictures on the Japanese book are misleading), because the brim is too wide and the angle too steep. 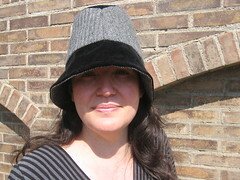 It must be said though that the pattern is really good and the final hat is beautiful and has a nice structure. I can reconfirm that the patterns in the book include the seam allowance (I thought they did not at first, sorry again Jane!). In this particular hat we’re talking 0.7 centimeters on the lining and 0.6 centimeters on the rest, except for the headsize which is 1 centimeter. Just knowing that it’s included makes it easier to follow the instructions, even though they are in Japanese. 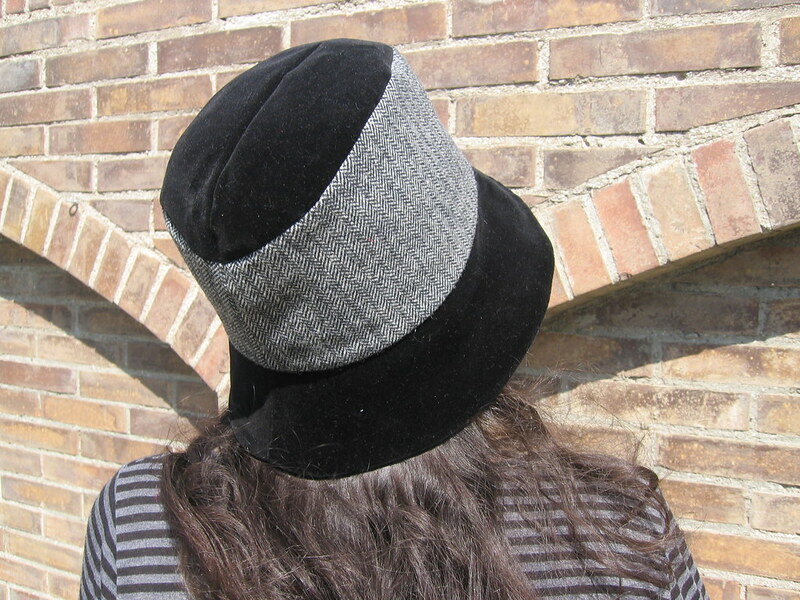 The fabrics I have used are a black velvet I had left over from this hat and a black and white herringbone wool fabric recycled from an old pair of trousers. 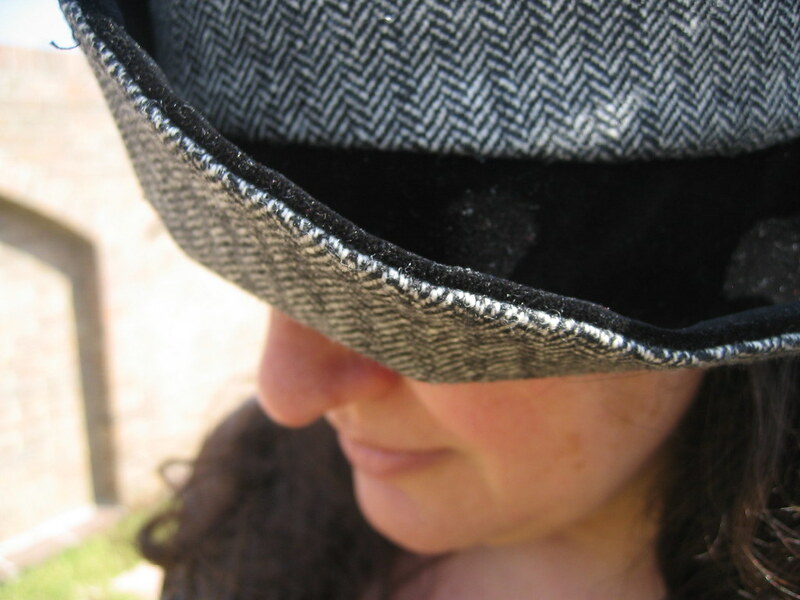 I used a heavy weight iron-on interfacing that I thought would give the hat the body it needed, but I believe that if I do another one of these I will try with a lighter weight interfacing. To make my life easier, I traced the pattern onto the interfacing, cut it and then ironed onto the outer fabric, although to tell you the truth I started with the wrong foot, adding allowance (which turned out to be included) and worst of all sewing the top and side parts the wrong way around (doh!). But the extra seam ended up being a blessing because it gave me enough space to cut trim the excess and start again. I made size L, which produces a hat with a 59 centimeter circumference. I believe the end result was a little bit smaller, but seems to be fixable by putting a stretcher and letting it stay there overnight (I did it and it worked, but shrunk back during the day… this time I’ve sprayed it with a little bit of water which I hope will help it to stay in place). 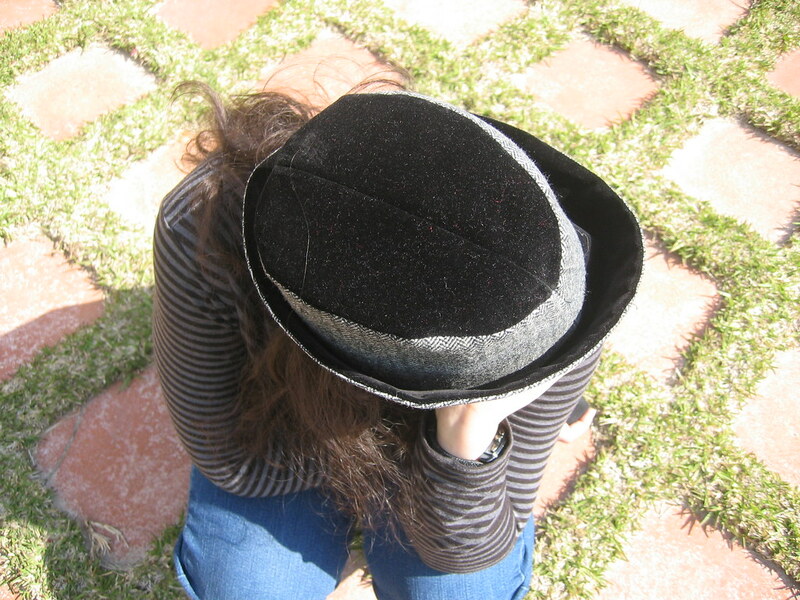 Now that the Hat Parade is over, I can move to other pastures, and my next project (really, I promise) will be to finish the trilby that I had already started, messed up, and have to start again. This is from the book that I reviewed some time ago. “スタイリッシュクロッシュ” patterns are including seam allowance. In this book, it is written that seam allowance of the lining must be changed to 0.7 from 0.6 using same pattern. Because the lining is smaller than face, it is beautifully finished. I hope that my advice is helpful for you. 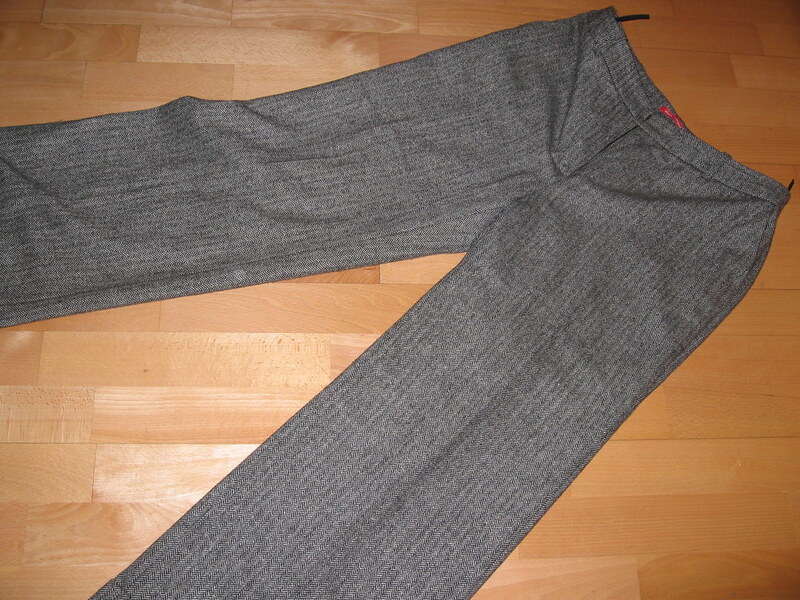 In this bookスタイリッシュクロッシュ,the pattern includes seam allowance. A seam allowance of head circumference is 1.0cm,and the others 0.6cm. When you make the lining,seam allowance must be changed 0.7cm. Although using same pattern, the lining must be smaller then the face. I’m sorry I’m a poor explanation. I wish you make lovely hats! I want to thank them for their effort in explaining to me this whole seam allowance business in English. 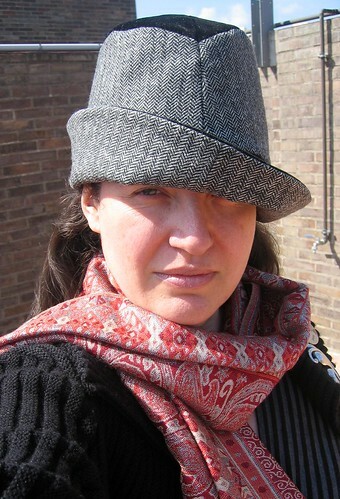 By the way, I will be a few days in London soon… any suggestions on millinery related visits? I’ve corrected the link to the book review! 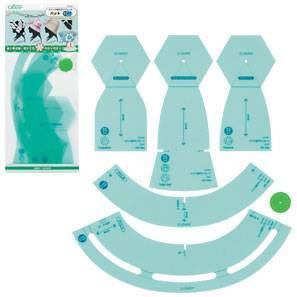 Apparently something that has existed for years, I discovered today some fun looking hat templates made by the Japanese brand Clover. I came across these while I was (as tends to happen) looking for something else. My current project is a sewn fabric trilby hat from a Japanese book (Stylish Cloches – スタイリッシュクロッシュ) that I’m doing at the same time as Jane, from Glorious Hats. She bought the book because she saw it here, in my blog, and then we decided to try one project together (although we’re in opposite sides of the planet). One doubt we had was whether the patterns came with seam allowance, but I was pretty convinced (after doing some research) that all Japanese patterns come without the allowance, that has to be added later on. Well, now I have my doubts about that, as I’ve already made the lining for the hat and it seems huge! I wish I could read Japanese!! Anyway, I started a search on Internet trying to find a Japanese milliner that might be willing to help us with this dilemma. I’ve posted comments on a couple of blogs and I hope something comes out of it. While doing all that I have found these fun looking templates. The beauty of them is that they are made of hard plastic, and come with a little wheel to mark the seam allowance. So you trace the stitching line first, and them roll the wheel around the template to mark the allowance… pretty clever! Take a look at the promotional video. Alright, it’s in Japanese, but it’s really fun to watch! If only we could buy this stuff… anyone for a trip to Japan?